The Razer BlackWidow Chroma V2 is the successor of the BlackWidow Chroma (provided that you consider the BlackWidow Chroma X only as a variation of the original). It is available since January 2017 and can be considered as a high-end mechanical gaming keyboard. The BlackWidow series inspires gamers since 2010, when Razer introduced the first model to the world. 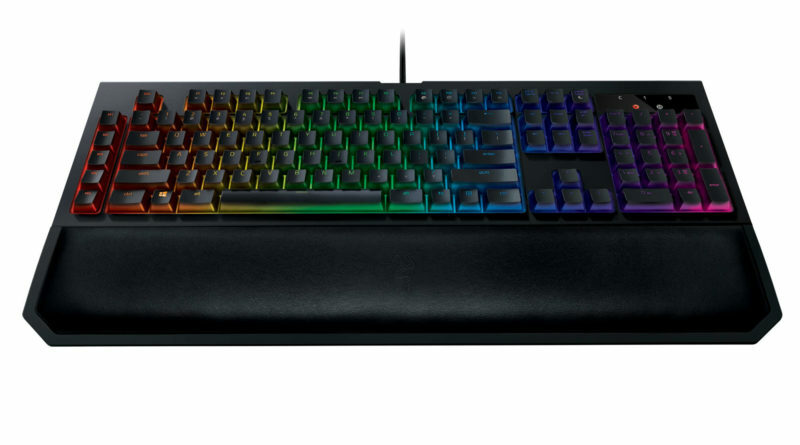 In 2014, they created their first mechanical gaming keyboard with RGB illumination, the BlackWidow Chroma. In 2015 and 2016, they created two more BlackWidow variations, the Tournament Edition and the BlackWidow X. Now, the BlackWidow Chroma V2 lines up as an official successor. The basic features didn’t change too much. The Razer BlackWidow Chroma V2 is still a mechanical gaming keyboard, it has 5 dedicated macro keys and uses the functions keys to control multimedia. But all the keys are fully programmable anyways, so you can set up macros for any key you like. 10 key-rollover anti-ghosting and the gaming mode, which prevents minimizing games through the windows key, assure a worry-free gaming experience. New at version 2 is the magnetic wrist rest. It makes typing and gaming more comfortable and makes long sessions more enjoyable. The keyboard also offers some convenient ports, an USB device and a headset can be directly connected to the keyboard. The Razer BlackWidow Chroma V2 can be illuminated with more than 16 million different colors. The illumination can be adjusted for every single key and there are many different illumination modes and lighting effects. For example, the keyboard can react to user inputs or highlight some special regions (like the WASD keys for instance). Furthermore, game developers can use the Chrona SDK to control the keyboard’s illumination and adjust it to changing in-game situations. For instance, they can use the lighting to send some alerts or to signalize cooldowns. There are already a bunch of games, which come with rich illumination support for the BlackWidow Chroma. A list of these games can be found on Razer’s web site, it involves Diablo, Overwatch, Unreal Tournament, Dota 2 and many more. For quite some time, Razer produces its very own mechanical gaming switches in cooperation with big electronic companies (e.g. Kailh). Up to now, there were two different switches – the Razer Green Switch, a tactile and clicky switch and the Razer Orange Switch, a tactile but silent switch. With the Razer BlackWidow Chroma V2, the company introduces a new switch type – the Razer Yellow Switch. It is a silent and linear switch with an actuation force of 45 g. Razer says, “the switch’s feel and properties are meant for FPS and MOBA players who press certain keys thousands of times over the course of a match session.” The switches are designed to last 80 million keystrokes, which is longer than most other currently available mechanical switches. "Razer's updated V2 BlackWidow is a top notch keyboard, with very minor drawbacks." "The Razer Blackwidow Chroma V2 fights through some tough competition but manages to hold its own. If money is no object, make sure to consider Razer." "The Razer BlackWidow Chroma V2 is well-designed mechanical keyboard that almost cracks the formula." "A great mechanical keyboard with lots of customisation options and comfortable detachable wrist rest, the Razer BlackWidow Chroma V2 just about justifies its high price tag." "The BlackWidow Chroma V2 is pretty much everything you want out of your gaming keyboard. But there are most cost effective options if you're not ensconced in the Razer ecosystem." "This sturdy, handsome keyboard packs responsive Razer mechanical switches and attractive lighting. We'd just like to see some tweaks to the software, and a price drop." "Taken in isolation, the BlackWidow Chroma V2 is a solid keyboard – but when it is compared to both its predecessor and its main rivals, it starts to look less appealing." "The BlackWidow Chroma V2 is an attractive gaming keyboard with comfortable keys and some helpful extra features." "The Razer BlackWidow Chroma V2 is a high-end gaming keyboard that boasts plenty of color and function customization options, and keys that feel good for both work and play."